As most African coffee-producing countries (with the exception of Ethiopia), Rwanda was planted in coffee by colonial interests from Europe in order to supply the booming market back on their home continent. High-yield, low-cost varieties were introduced in the 1930s and made compulsory to farmers by Belgian colonials, offering little in the way of quality incentive or development: Coffee was intended to be a cheap commodity available in abundance, and the colonial government held strict mandates over exports in addition to imposing very high taxes on growers, practically enslaving them to the industry. 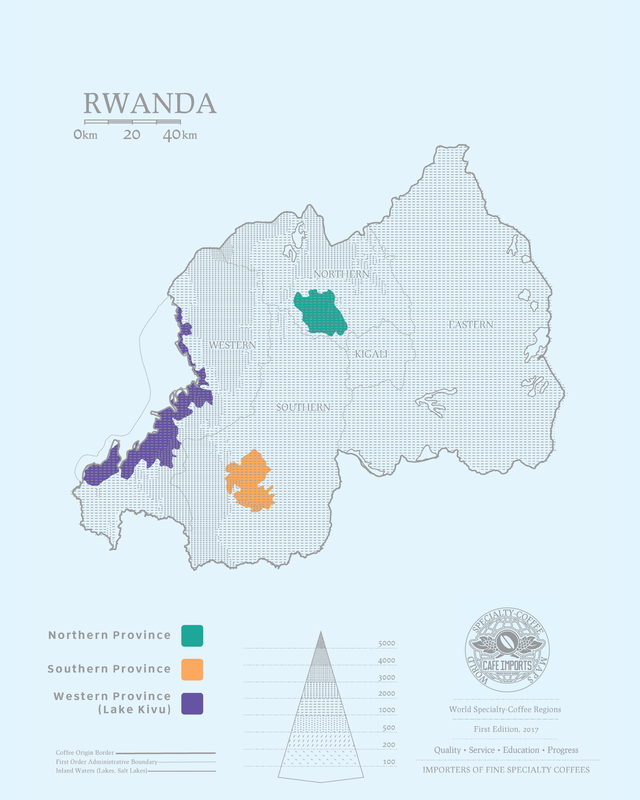 Roughly 75 percent of the land mass of Rwanda is used for agriculture, and more than 35 percent of its population are subsistence farmers, many of whom rely on coffee for at least a portion of their income. While coffee became the staple agricultural export by the 1990s (despite very low market prices), its production, along with the national economy in general, was devastated by the genocide in 1994. Nearly 1 million people were killed in the national tragedy, which stalled development and slowed progress for nearly a decade. Targeted programs initiated by the government in the early 2000s encouraged Rwandans to use specialty coffee as one of the means to recover and to create a new niche agricultural market. The erection of the first washing station with USAID support in 2004, and the country was the first to host a Cup of Excellence auction, bringing international recognition to the “Land of a Thousand Hills” as a potential producer of exceptional quality. Today, this tiny country (roughly the size of Maryland) contributes less than 0.2 percent of the global coffee supply, but its reputation for special quality and unique characteristics—not to mention the incredible story of its development as a specialty-coffee origin since the genocide—have earned Rwanda a significant place at the table among African origins. One of the major obstacles facing the absolute embrace of Rwandan coffee is the presence of a peculiar and particular defect that occurs in lots from here, as well as Burundi and, to a lesser degree, nearby Democratic Republic of Congo. Colloquially called “potato defect,” it is caused by the presence of bacteria in the coffee cherry, which after roasting imparts an unmistakable smell and taste remarkably similar to that of a raw potato. The defect is largely contained within individual beans, which means that identification of the taint is crucial to maintain high specialty quality, however, it is not visible and is virtually undetectable in the parchment or green coffee. At Café Imports, we thoroughly cup test and analyze the aroma of multiple samples of the green coffees we buy from affected areas, including our Rwandan coffees. Current intensive research into eradicating the defect or improving identification and sorting techniques holds the key to advancing Rwanda’s coffee into the specialty mainstream; until then, potato defect continues to be a reason buyers sometimes pause even when presented with stunning cup characteristics and quality. Our travels to the Lake Kivu region have resulted in phenomenal lots both from washing stations like Kabrizi and Kigeyo on the lake’s eastern shores, and Gishamwana Island, a seeming coffee paradise where the plants are grown, processed, and milled in an environment as yet untouched by the same diseases and pests that crop up on the mainland. Café Imports’ will continue to support further research into eradicating the potato defect, which will certainly bring Rwandan coffee to the next level of quality and improve on the amazing reputation it already has. In the meantime, however, we have been pleased, proud, and privileged to be working with producers there who are currently producing some of the cleanest, most dynamic, and highest-quality coffees the country and its remarkable terroir has to offer. We love Rwandan coffee, and we are excited to share the very best of it with you.